The first question you asked me when we met was whether I was writing the PWD exams. I was totally unaware that such an exam was around the corner, nor was I interested. You also asked whether I planned to do M.tech, and obviously, I had no such plans. God only knows how I managed to pass B.tech with decent marks. I had dismissed you as one of those nerds who had come to waste my time. However, you turned out to be different. Before I knew, we were engaged to be married and you were making me laugh with your insane jokes and hour-long phone calls. Your called me morning, evening and night. You said you were determined to know the person I was before we tied the knot. I took time to open up. You were an open book. You were mostly vegetarian and I loved non-vegetarian. I was a bibliophile and you read only Osho, IS codes or Civil Engineering handbooks. We were different like chalk and cheese. By the time we got married, I knew I could trust you. Yet I was scared. You knew for a girl, it was such a huge step. She had to leave behind the comfort of her home and create a new home for herself in a stranger's home. So, you stood by me, became the ice-breaker to make your family warm up to me. Soon, your home became my home. You weaseled into my heart and cemented a permanent place there. We moved to Dubai to further our careers. With your experience, you made my job easier. As we worked on the same project, you were always there to guide me. The days were hectic, sometimes we met each other only on the road. I would be returning from my day job and you walking to your work site for your night shift. Yet, we became best buddies. We mostly bonded over food and you walked around our area to find libraries where I could indulge in my first love: reading. The only things that we had in common were our laziness and gluttony. Yet we managed to make even those vices into virtues. We hunted down the best restaurants to experiment with food. Then we would walk home determined to lose the calories gained, talking about everything under the sun. When it came to laziness, we struggled to understand who excelled in that area. We fought over whose turn it was to switch off lights, to put the clothes on the clothesline or take out the trash. Now our dilemma has ended. We have our junior who has acquired both our lazy genes and beats us hands down at being the laziest in the house. Over the years, we have been through difficulties. We both lost loved ones. You lost your mother, and I lost my father. I have realized that whatever happens, I can always trust that you will be there to support me. You were the one who pushed me to start writing. And it has become my passion, my happiness. You surprise me with gifts and tolerate my tantrums when I am in one of my moods. I know you don't like public displays of affection, but hey this blog is my oasis. This is my private haven where I jot down my thoughts and you deserve a pride of place right here on my blog. Therefore, in this month of love, all I want from you is a promise that you will never change. Be the same witty, kind, and handsome person I fell in love with. Linking this post with #MondayMommyMoments being hosted by Amrita and Deepa. The prompt this week was to write a letter to the love of your life. 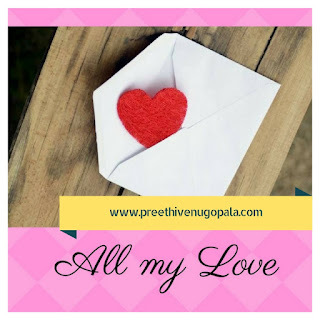 What a lovely letter Preethi. I am sure your heartfelt thoughts will be deeply cherished by your better half! Sometimes remembering the smallest of gestures from the past rekindles the fire, doesn't it? That's a lovely letter.... beautifully penned. Junior is the laziest ? That's some interesting family story Preethi.The men we marry actually say a lot about us.They can help us or hinder us.So choosing with care is important. Lovely love story .I am sure your husband will love it.